Don't have a full day to plan with your business? Not a problem. 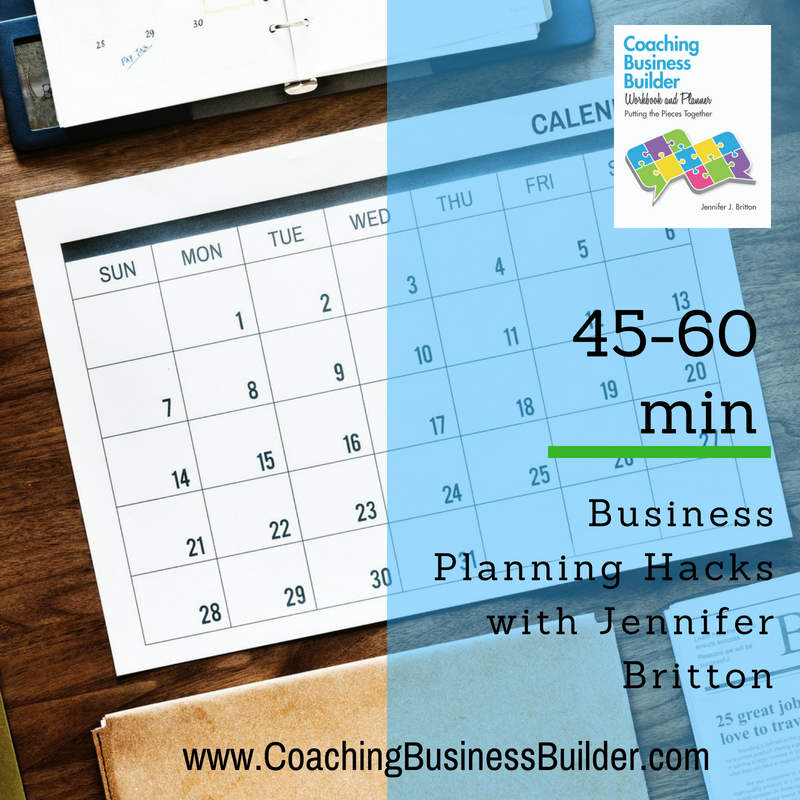 Join Jennifer Britton for a 45-60 minute planning hack online. Join Jennifer for 45-60 minute program planning hacks. During these live virtual calls you will move through structured short sprints to plan real-time around your business. We'll be using the Coaching Business Builder Workbook and Planner OR the PlanDoTrack Workbook and Plannner so bring your copy of the book. The cost for these is $25 US per hack. Hacks are held virtually on zoom. You can phone in, or preferably, dial in with your computer so you can follow along with Jennifer. Are you a coach, trainer or facilitator? Looking to get a head-start on your programming work? Join Jennifer for a 45 minute program design hack as we move through the initial stages of planning a new program. These are only 45 minutes in length so you will want to build in more time afterwards for taking action and further refining your ideas. Offered since 2016 these have been very instrumental in creating the seeds for a variety of coaching, webinar and retreat programs! On a monthly basis, Jennifer offers 60 minute month end reflection and next month stock taking. These are real-time planning and reflection sessions. Cost: $39 US. They are usually held on one of the last few days of the month. Calls are held on zoom. Jennifer will supply you with worksheets for the 60 minute session. Questions? Reach out to Jennifer by phone at 416-996-8326 or email at info@potentialsrealized.com.